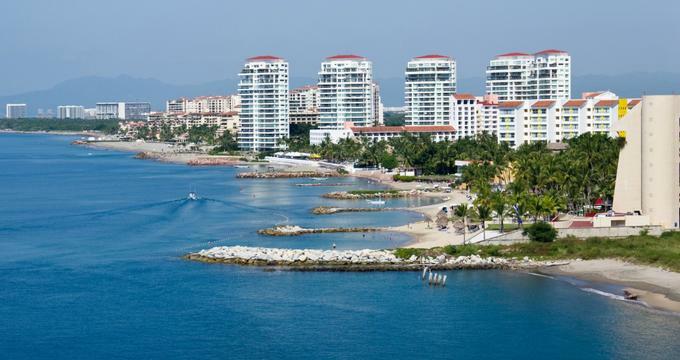 Puerto Vallarta is a gorgeous vacation destination on the Pacific Coast’s Bahia de Banderas in Mexico. The area is popular among American tourists who flock south for the sunshine and beautiful beaches. A range of wonderful all-inclusive resorts are on offer, ranging from those right near the center of the city to more tucked-away retreats in places like Punta de Mita and the planned resort community of Nuevo Vallarta, Mexico. 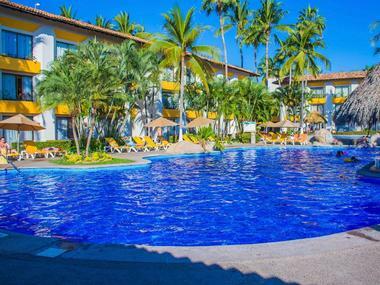 The all-inclusive resorts in Puerto Vallarta tend to be family friendly, so families will find many options to choose from. However, couples looking for a romantic getaway or parents who want to escape the kids in paradise for a week or two will find adults-only properties, such as the Secrets Vallarta Bay and Casa Velas, that completely meet their needs. Barcelo Puerto Vallarta is a beautiful upscale hotel located minutes away from Mismaloya Beach and also near the Zoologico de Vallarta zoo. 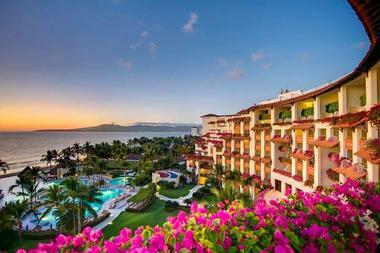 The resort is one of the best all-inclusive resorts in Puerto Vallarta that caters to families. There are several beautiful swimming pools with views of the bay and the grounds are set in the jungle but have been beautifully pruned and landscaped. With a long list of daily activities, you are sure to never be bored at this hotel. There are exercise classes, water sports, ping-pong tournaments, basketball, archery, and more. The hotel has a kids’ club, games room, and movies shown each nights for kids. 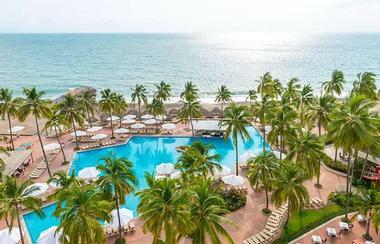 Buenaventura Grand Hotel is a sprawling and busy all-inclusive that sits right on the beach with views of Banderas Bay. 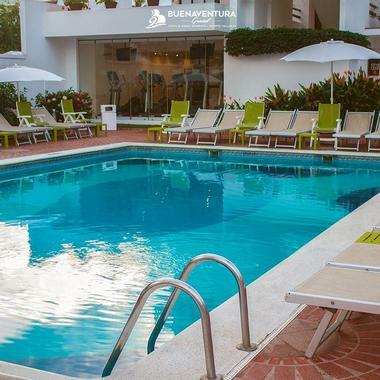 The hotel offers almost everything you could hope for on your trip to Puerto Vallarta. The property has pools for adults and children, a spa, a modern fitness center and more. Children will be entertained in the kids’ club with plenty of fun activities and play things. Some parts of the hotel are a bit worn, but guests keep coming back year after year for the full roster of activities and features. The hotel is actively trying to upgrade the worn parts of the property, with renovations happening all the time. 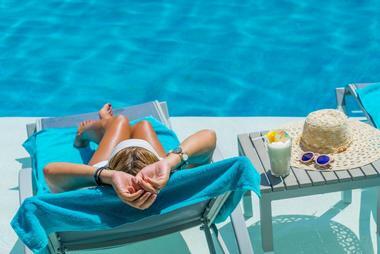 Casa Velas is an adults-only resort nestled amongst tropical gardens near Los Muertos Beach. The property’s upscale suites have a variety of modern amenities, including iPod docks, minibars, safes, and free Wi-Fi. With a bit of an upgrade comes balconies, terraces, and beautiful views. Some suites have private plunge pools, whirlpool tubs, and separate living rooms. The resort includes complimentary breakfast. There are also two bars and two restaurants, including an Asian restaurant on the beach. Additional perks include two outdoor pools, one with a swim-up bar, a hot tub, a golf course, and a private beach with cabanas for relaxing. This beautiful all-inclusive resort is located on Bahia de Banderas near the Malecon boardwalk and the Museo del Cuale Puerto Vallarta. The relaxed and spacious rooms have balconies and either pool or garden views. All of the rooms have modern conveniences like flat screen televisions and Wi-Fi. Family rooms include bunk beds and there are also ocean view suites available, which have whirlpool tubs. 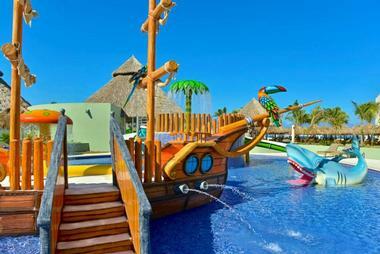 Your kids will want to return year after year after spending a vacation exploring the gigantic kids’ pool area, which features nine water slides, a pirate ship, and a castle. There’s also a covered sand pit and a fantastic kids’ club for when mom and dad need some alone time to chill out in the spa. A bit outside of Puerto Vallarta on a private beach in the planned resort town of Nuevo Vallarta sits this luxurious all-inclusive. The views overlooking Banderas Bay are fantastic and the location is perfect for those who want to get out and explore a bit as the Aquaventuras Park and El Tigre Golf Club are both fairly close, as are other Nuevo Vallarta attractions. However, downtown Puerto Vallarta is a bit of a drive away. The property’s elegant rooms have balconies and ocean views. Resort amenities include five upscale restaurants, which offer a range of cuisines and the option to do a la carte or buffet style. There are also five bars, a fitness center, an outdoor pool, and a spa. Fiesta Americana Puerto Vallarta is smaller and older than many of the massive properties on our list, but it still remains one of the most reliable choices for an upscale all-inclusive in the Puerto Vallarta area. The beach sits on one of the nicer beaches in the North Hotel Zone and guests constantly brag on the hotel for having some of the best customer service in the industry. The property is family friendly, with playgrounds, water sports, clubs for kids and teens as well as activities and classes for youngsters. There is also a large, heated, outdoor pool with a swim-up bar and a shallow area for kids. 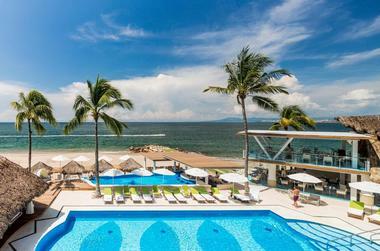 Friendly Vallarta is set on a sandy beach in Banderas Bay. The beach has especially calm water for the area, which can be enjoyed from the sand or from one of the nine ocean-facing pools. The 218-room property is typically quite busy, so if you are looking for a quiet retreat this one may not be for you. However, if you like to party all night long, this may be the perfect place for you. Guests aren’t just young college kids and partiers though, families stay here as well. There is an outdoor kids’ club that organizes activities for kids on the sand so your kids will be entertained while mom and dad party like they are in college again. Garza Blanca Preserve Resort and Spa is located on a secluded section of beach on the south side of Bahia Banderas. The private beach offers great swimming in the ocean due to the small waves. Snorkeling and stand-up paddleboarding are also popular activities here. The property has beautiful views of the sea and surrounding jungle and a beautiful infinity pool with fountains and rock formations that will make you feel like you are in nature. The property has a delicious gourmet restaurant, a tequila tasting room, and an impressive wine cellar. A menu of more than 20 treatment options is available at the hotel’s serene Hamara Spa, where you are sure to feel rejuvenated and pampered. One of the most comfortable and luxurious resorts in the Puerto Vallarta area, Grand Velas Riviera Nayarit is set in Nuevo Vallarta on a long, pretty beach that is perfect for strolling. Every single one of the 265 rooms are a suite with separate living space, private balconies, ocean views, and extra creature comforts such as Nespresso machines in the rooms. The list of amenities is long and includes a three-level infinity pool within sight of the beach, a luxurious full-service spa, a supervised kids’ club and a separate club for teenagers as well as five restaurants with tasty food. 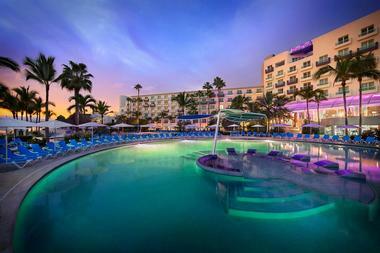 The Hard Rock Hotel Vallarta is located on the beachfront in Nuevo Vallarta. One of the first things guests notice is the massive lobby with two large art installations made from musical instruments and LP covers. However, there are impressive elements throughout the resort including two beautiful swimming pools, a spa with views of the ocean, and several delicious restaurants. The rooms are modern and decorated with rock-inspired elements. There is nightly entertainment and a couple of bars that offer an exciting place for young couples and singles to mingle. Families aren’t excluded from the fun at Hard Rock, though, there is a kiddy pool and a kids’ club with supervised activities for the tots. 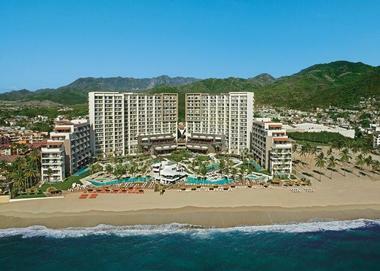 The Hilton Puerto Vallarta is a modern resort situated on the beachfront of beautiful Banderas Bay. The rooms are large and clean and all have balconies, some with ocean views. The beach is sandy and has cabanas and day beds available for resort guests. Beach vendors can be a nuisance in many places in the area, but this resort has security guards who keep them from entering the beach area, so you can relax without interruption. There are both adults-only and family swimming pools, a relaxing spa, and a business center. For families, there is a kids’ club with its own small pool and a full schedule of fun activities. As far as all-inclusives go in the area, the Hyatt Ziva is hard to beat as it truly checks all the boxes of what one would look for in a resort property. The beachfront is beautiful and clean and set on a cove in isolated Conchas Chinas. The rooms are modern and have luxurious features. There are swim-up suites with private pools and five public swimming pools with dedicated pools for children, adults-only, and scheduled activities, respectively. As far as dining goes, they have five restaurants, which serve free-flow food and beverages to resort guests. For families, the onsite kids’ club has a daily activities schedule and plenty of fun toys and equipment for young children. Perhaps the only drawback is that the resort is quite popular, which means it can feel a bit crowded. Iberostar Playa Mita is an upscale beachfront resort a bit farther away from Puerto Vallarta, near Punta de Mita town. The resort features bright and spacious guest rooms with private patios or balconies and either golf course or garden views. There are upgraded rooms with views of the oceans and suites with additional living spaces. For those who like a little extra pampering, there are luxe spa rooms available that have two whirlpool tubs and extra pampering bonuses included in the room. The property has plenty of dining options, with five restaurants and eight bars. For families there is a kids’ club, a swimming pool, and a water park. Golf, tennis, yoga, and more are available for resort guests as well. Marival Residences and World Spa is not the first choice of visitors looking to party in Mexico; however, if you are after a quiet retreat, it is worth consideration. 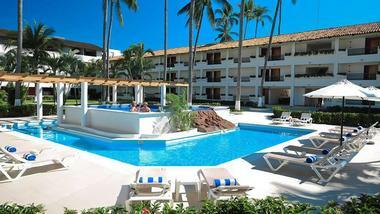 The hotel property is located in Nuevo Vallarta, a planned resort community, a half mile from the beach. They do offer a private beach, but it is accessible only by shuttle. Visitors are happy to put up with this small inconvenience to enjoy one of the most extensive lists of included amenities of any all-inclusive in Puerto Vallarta. Resort guests can enjoy an included nanny service, unlimited free green fees at three nearby golf courses, a free tennis clinic, unlimited tours, a fitness center, and a range of spa treatments. This beautiful upscale resort near the beach sits overlooking the Pacific Ocean and is not far from popular sightseeing destinations. The hotel features terraces on the ground floor and balconies on the upper floors. 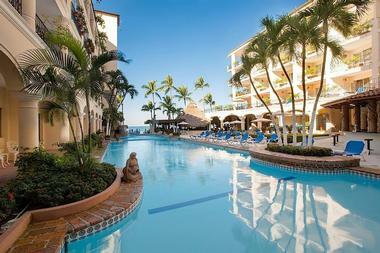 The all-inclusive includes free drinks and all meals at four restaurants and four different bars. There are a variety of amenities, including swimming pools, a spa, beach, sports courts, and a disco. They even have miniature golf and kayaks available. For little ones, there is a kids’ club to help mom and dad have some time to themselves. There is also a fun kiddy pool with waterslides and scheduled activities for all ages. 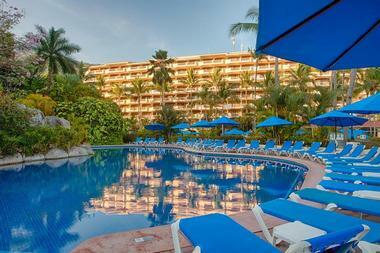 Now Amber Hotel Vallarta is the perfect destination for families. 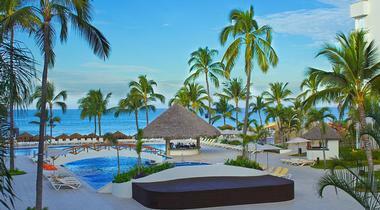 The sprawling resort is located on the beachfront in Banderas Bay. The rooms are all suites with private balconies, and some of the rooms have semi-private pools attached. There are three pools with ocean views, swim-up bars, and a hot tub. The kids’ club offers tons of fun for kids, including a waterslide. There is both a kids’ club for little kids and a separate club for teens. Dining options include seven different restaurants and bars. All dining is included and ranges from casual buffet style to fine dining. The spa is huge and has a full menu of luxurious services as well as an indoor pool. Playa Los Arcos Hotel Beach Resort is a fantastic urban beach resort located right on Puerto Vallarta’s main beach, Playa del Sol, in the Romantic Zone. Most of the hotel’s rooms are ocean view. The hotel is boutique style, lacking in amenities when compared to other properties on our list, and a bit dated. However, the location is perfect for those who wish to experience a true Mexican city during their beach vacation. The restaurant has a beachfront bar and restaurant that are typically pretty lively. The beach itself is nice and has a boardwalk with many other restaurants. People don’t come here to escape but to experience the lively atmosphere, art scene, clubs, restaurants, and more. The Plaza Pelicanos Club Beach Resort is a mid-range resort hotel that offers small rooms with somewhat older furnishings. Many of the rooms are pool-view as the property is not located on the oceanfront. The beach is only a short walk across the street and features an exclusive beach club for resort guests that even has an ocean-view pool. There are also restaurants on the beach as well. Las Glorias beach is perfect for people-watching and great for visitors who want to be on a beach with plenty of things to do. There is a kids’ pool as well as a small kids’ club for kids aged 4-12. 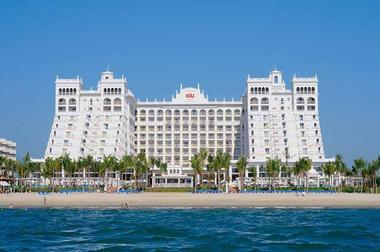 Hotel Riu Palace Pacifico is a beautiful beachfront property that offers plenty of space to relax. The sprawling resort offers 445 rooms and all of the amenities you need to have a great vacation. Rooms are a blend of European luxury style with a relaxed beach vibe. The grounds are well kept and gorgeous, including perfectly landscaped public areas, a huge pool with swim-up bar, and lounge areas. There are a number of dining options including high-end indulgences. 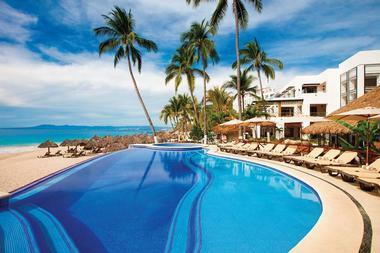 The property is located on laidback Nuevo Vallarta, which offers a true escape and retreat from the business of life. The Royal Decameron Complex is almost like a small village unto itself. The massive 7-acre property has 620 rooms in low-rises situated around five swimming pools. 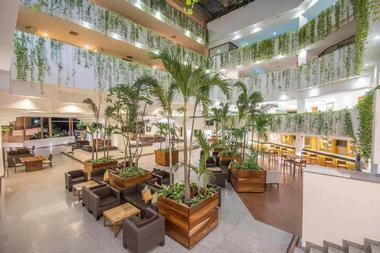 The hotel is so large that it can seem a bit daunting to walk from one area to another, but the amenities are top-notch. The entire property has a fun environment with bright colors and activities throughout. There are a number of restaurants, with a good variety of food options. Outdoor tennis courts, an open air-theater, and a nice beach with free ocean sports gear available for use mean there are plenty of things to keep you busy. There isn’t a kids’ club, but there are plenty of kid-friendly activities to keep the little ones in your group happy and entertained. 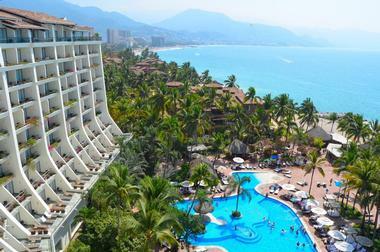 Many Puerto Vallarta all-inclusives are geared toward families. So, if you are looking for a romantic retreat, or just a relaxing vacation without the pitter-patter of little feet, your options are a bit limited. However, you will not be disappointed by your choices with this luxurious, adult-only resort right on the beach. The smaller, intimate property has beautiful and modern rooms, many with ocean views. There are three outdoor pools, a large spa with indoor pools, and more. The all-inclusive includes unlimited premium booze and a number of restaurants ranging from upscale French dining to a casual international buffet. 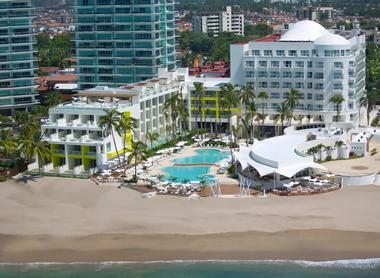 The Sheraton Buganvilias Resort offers the best of both worlds with a location on the beachfront right near downtown Puerto Vallarta. The location offers easy access to the sights and sounds of Vallarta but still has space to relax and chill. There is plenty of seating throughout the public areas, including the large pool. There is a nice spa, several restaurants and four tennis courts. The beachfront is not much to speak of as it is rocky, narrow, and public, meaning many vendors come each day. However, if you are looking to experience the true Vallarta scene while still having a relaxing getaway, the Sheraton is a good option. Sunset Plaza Beach Resort and Spa is located on the beachfront in Las Glorias. Despite the name, the sun doesn’t actually set over the beach, but you do have stunning views of the sunrise. 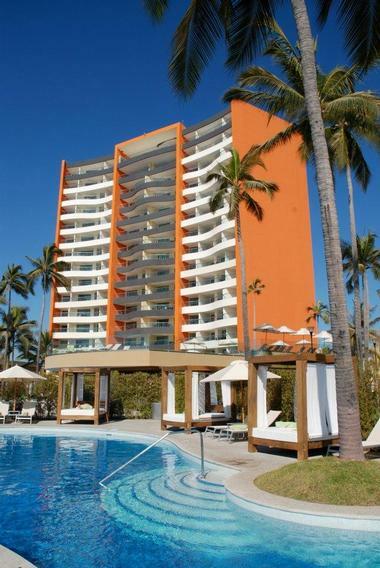 The luxury property offers an intimate and upscale hotel right in the bustling city of Puerto Vallarta. There are three onsite pools, with one reserved for adults only. There is a kids’ club offering a range of activities for children. The Zen Set Spa offers treatment rooms and massages. The all-inclusive package includes free-flow food and beverages from the property’s two bars and two restaurants. Velas Vallarta Suite Resort Hotel is one of the most popular all-inclusives in the entire region, not to mention in Marina Vallarta. The property is located on the beachfront and offers huge rooms with kitchenettes. Most of the rooms have ocean views and many are plenty large enough to accommodate families. The gardens and grounds are elegant and feature a roaming flock of peacocks, several pools including a lazy river, and a wide range of recreational options, including tennis courts, a fitness center, and a spa. The restaurants offer delicious food, especially when considering it is an all-inclusive. The rooms could use a bit of updating, but the amenities and size of the rooms seem to make up for it. The Villa Premiere offers the full Puerto Vallarta experience as it has all the amenities and comforts you would expect from an all-inclusive resort, but still has some elements of an urban boutique hotel and is located close to downtown. 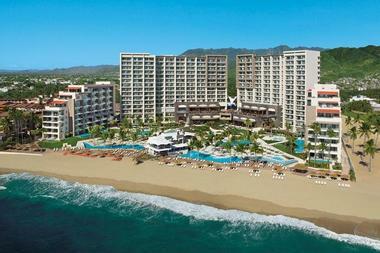 Playa Camarones sits directly in front of the property and you can walk to downtown Puerto Vallarta. The hotel is small, with only 89 rooms, but still offers a nice range of amenities and extras in their all-inclusive package, including meditation and yoga classes on the beach each day, ocean views from every room, and three restaurants offering a range of international cuisine. The property is only open to guests aged 16 and up, so it is the perfect place for a couple’s retreat or for families with older children.